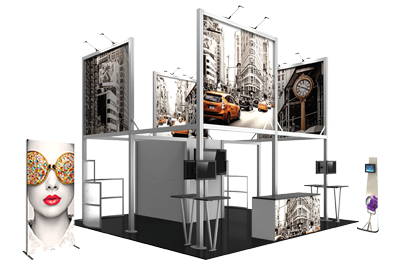 Linear™ Pro Modular Backwall Kit 22 provides a modern, slick and stylish appearance. 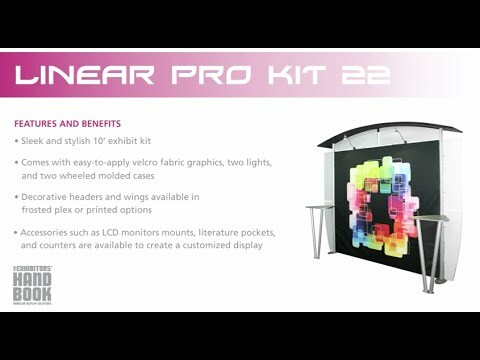 The extrusion based inline exhibit features a Hook and loop-applied fabric center graphic, UV printed or frosted plex headers and wings, as well as a pillowcase fabric canopy. Two tables provide additional space for products or messaging and are available in four color options. Two 50 watt spotlights provide illumination to messaging.